Magic City Chorus’ Saskatoon Show is coming up November 4th 2017 and we have a special treat for you! The show will have a Canadian Focus, amazing story line with a full cast and special guest artist! Experience the tale of two sisters who discover a life time of Canadian treasures while going through their grandparent’s old trunk. The show will feature music from your favorite Canadian artists, like Joni Mitchell and Gordon Lightfoot, all remastered in 4-part a cappella for your enjoyment. Magic City Chorus, directed by Cheryl Pearce, is a women’s 4-part a cappella show chorus affiliated with Sweet Adelines International. This chorus brings together women from across Saskatchewan with a large repertoire of classic barbershop style songs, folk music, and modern popular music. 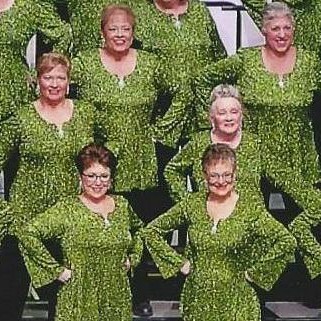 Magic City chorus is the school of choice for women who love to sing and perform. As a member of the audience, you will feel their passion shining through! Our show will also include a guest performance from Joseph Naytowhow, a gifted Plains/Woodland Cree (nehiyaw) singer/songwriter, storyteller, and voice, stage and film actor from the Sturgeon Lake First Nation Band in Saskatchewan. As a child, Joseph was influenced by his grandfather’s traditional and ceremonial chants as well as the sounds of the fiddle and guitar. Today he is renowned for his unique style of Cree/English storytelling, combined with original contemporary music and traditional First Nations drum and rattle songs. Tickets are now available at McNally’s Book Stores, online “See Us”, and from our chorus members.